It is almost time for the third annual Ravelry Indie Design Gift-A-Long! What exactly is the Gift-A-Long (or GAL, for short)? Think of it as a six-week knit- or crochet-along to get ready for the holidays focusing on the patterns published by independent designers. 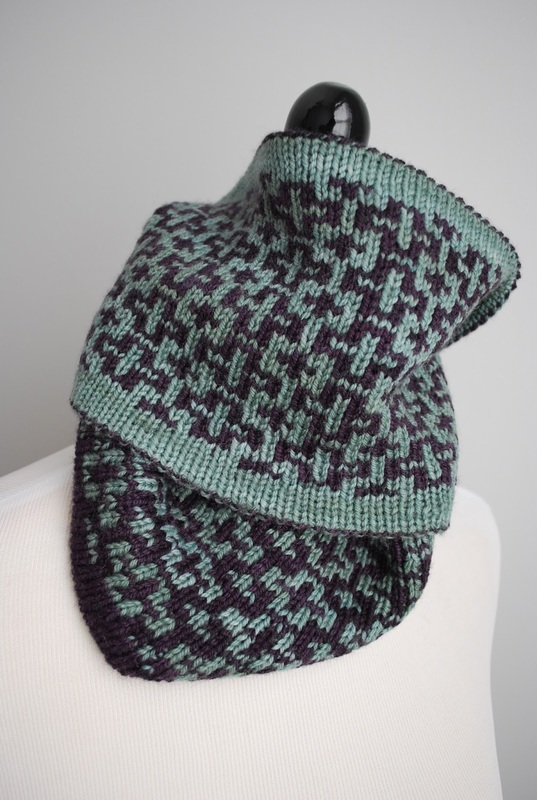 There are KAL/CAL threads for a number of categories (hats, scarves and shawls, sweaters, baby items, etc.) along with games and lots of chatter. Basically you can come join the group and have a big cheering section while you cast on and try to finish your holiday gift crafting in time! This year, the GAL will begin at 8 p.m. Eastern time on Thursday, November 19 (that's tonight! ), and run through 11:59 p.m. Eastern time on Thursday, December 31. To qualify for prizes, all projects must not be started until 8 p.m. tonight and must be finished before midnight on New Year's Eve. In addition, the GAL kicks off with a pattern sale. This year, there are 335 participating designers (including yours truly), and each designer has selected between five and 20 of his/her self-published patterns to put on sale. From 8 p.m. Eastern tonight through 11:59 p.m. Eastern on Friday, November 27, those selected patterns will be 25% off when you use the coupon code giftalong2015. You can find out which patterns each designer has selected by visiting that designer's designated GAL bundle (mine, for instance, is here). It is important to note that while these patterns are discounted for the sale portion of the GAL, all participating designers' patterns are eligible for the KALs/CALs, and all paid patterns (including those that might have been published in books or magazines) are eligible for prizes. So, what can you do now while you wait for the GAL to start? Well, go join the Ravelry group, for starters. You can also peruse the list of participating designers here or search the group bundle or Pinterest boards that will go live shortly before the official GAL start. And of course you can raid your stash and find the yarn and needles you'll need to start when the clock strikes 8! Since wrapping up my mitten spree, I've discovered that the projects I have on my needles have one big thing in common: They're both being knit out of my handspun. There's the brioche cowl that you've seen (and frankly it doesn't look much different from the last time you saw it), and then there's a pair of socks I started toward the beginning of October that I then proceeded to ignore for about a month. I finally pulled them out again last Friday, and they saw a good bit of attention over the weekend. Now they're my lunchtime knitting project. The yarn is FatCatKnits superwash Targhee that I spun up during the Tour de Fleece this year. I'm not doing anything fancy with the socks, as per usual when I knit socks with handspun; really, I just want the yarn to shine. I'm using 70 stitches and size 0 (2.0 mm) needles. I did two inches of 3x2 rib for the cuff and the rest is stockinette. It's a bit hard to see, but I've just started the gusset decreases. Tonight I'm hoping to cast on for yet a third handspun project. Rainbow has been asking me repeatedly to make her a pair of fingerless mitts, so I'm going to make her a pair for Chanukah (which is coming up rather soon, so I'm starting to feel a bit of pressure). As they're going to be a present, I'll only be able to work on them when she's not around, which means during lunch at work or in the evening after she's asleep. I'll be using this FatCatKnits Targhee in Hungry Horace that I spun earlier this year. This yarn is roughly sportweight, and I'll basically be winging the pattern. I have measurements of her arms, wrists, and hands, so I don't think it will be too difficult. I'm thinking of putting a single repeat of the lace pattern from my Corbusier Socks on the back of the hand for some interest. Considering how quickly the mittens knit up, I don't think I'll have any problem getting these done in time. Plus, this is a fractally spun yarn, which means I'm always going to knit one more round to see what happens to the colros. Yesterday was Indie Knit & Spin and it was a lot of fun, albeit an exhausting day. I did sell a number of skeins of handspun as well as several patterns, so I think it was a successful day. I still have most of the original pile of handspun, far more than I will likely ever knit, so I'm contemplating what to do with it. I may just mark it for sale on Ravelry, or perhaps I will open an Etsy shop. If you have any thoughts on this, I'd love to hear them! Targhee is one of my favorite fibers to spin, so I'm looking forward to getting to this one. 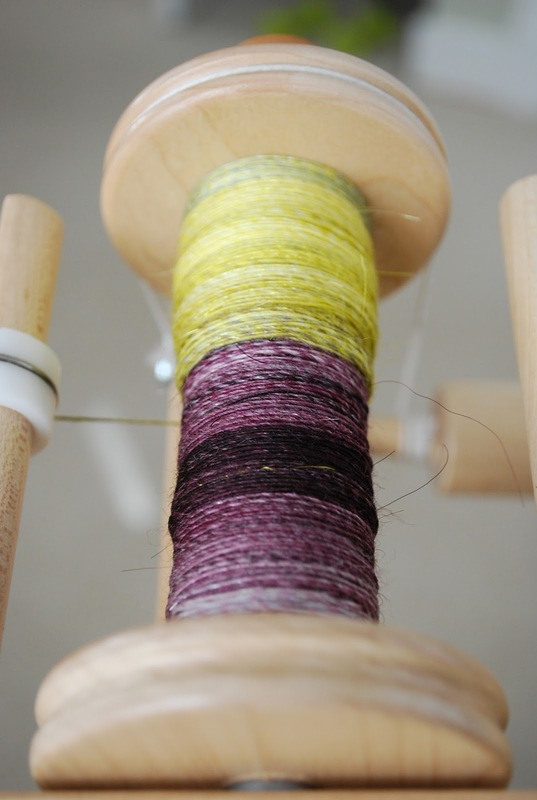 But let's get back to actual finished spinning. This was finished up last week but not in time for my Sunday post, and it took almost all week to get a picture (this time of year makes it very difficult to get decent photos of anything during the week). This is my finished 80% superwash merino/20% trilobal nylon sparkle from FatCatKnits in two colorways, Sam and Dean. This was the first shipment in the current installment of the FCK fiber club, the theme for which is Famous Couples. Sam and Dean are the brothers who are the main characters in the TV show Supernatural. I decided to spin up each color on its own and then do a combined chain ply. To do this, I held both strands of yarn together and alternated which strand I pulled the next loop from as I plied. This did some really interesting things to the colors in the finished yarn. The finished skein looks to be about DK weight and roughly 284 yards. I must admit that I was not a huge fan of the colors in the fiber, but I'm intrigued by how they mixed when plied. I'm really curious to see how this will knit up. The finished yarn is not as soft as it could be, giving the merino content. I think this is due to the sparkle, which I found a bit bothersome as I was spinning. The last time I had sparkle in fiber from Ginny, it seemed to be much finer and very well blended. This sparkle was long pieces that stuck out, and I found myself pulling them out altogether at times. You can see some of them poking out in the photo above. I'm sure they'll be less of an issue when the yarn is knit and washed a few times. Meanwhile, I am planning ahead. I really wanted to start something new last night, so I pulled out my Southern Cross Fibre October shipment, Corriedale in a very autumnal colorway called Splendour. I split the top into four long strips and am spinning them in order for another one of my pseudo-self-striping sock yarns. I'm also hoping to spend some time later today getting started on another spinning project for the natural (undyed) fiber spinalong that Lisa of Fibernymph Dye Works and the 90% Knitting podcast is hosting. I am somewhat ashamed to say that I've had some fiber from Louet North America that I was sent to review probably a year ago and I'd just about forgotten about it, so I am ready to start spinning it. I have 8 oz. of this beautiful gray Gotland that I'm going to spin into a two ply. When I pulled it out, I also discovered a spinning project I'd started long ago and forgotten, another bit of review fiber -- 2 oz. of camel/tussah silk that I started spinning on my Bosworth mini. This one won't count toward the spinalong as it was started before today, but I think if I spend a few minutes a day on it, I can finish it up rather quickly. I have a confession to make: I can't stop knitting mittens. They are the perfect thing for instant-gratification knitting, and after all the thin yarn I've been using lately, using worsted feels like I hardly have to put any effort in at all. I cast on for another pair of Waiting for Winter Mittens on Tuesday night, and even considering that I didn't have as much knitting time as normal the last two nights due to spending some of the evening doing preparations for the festival this weekend, I already have one mitten done and a good start on the second. I'm using the skein of Spud & Chloe Sweater leftover from Rainbow's sweater for these. It was untouched, so I could have returned it to the shop, but I liked the feel of the fabric after it had been washed so much that I thought it would be wonderfully suited to being a pair of mittens. My LYS is gathering some mittens knit for its mitt-along to send to Laura Nelkin's drive to collect warm winter items for Syrian refugees in Europe. The last day they're collecting stuff is this Sunday, so I'm feeling a bit of pressure (though I doubt I'll have much trouble finishing a second mitten before then). Meanwhile, I pulled a neglected project out to work on during my lunch breaks this week. Remember the sparkly handspun brioche cowl that I started for my mom way back at the beginning of October? Trust me when I say that it looks much better in actual daylight, a resource that has been very limited around here lately (if the sun does come out, it's usually when I'm at work). When I do actually sit down and work on this, it grows fairly quickly; the challenge is finding the time. I am looking forward to the long weekend over Thanksgiving to churn it out. Forgive me if I'm starting to sound like a broken record on this, but I do want to mention just one more time that Indie Knit & Spin is this Saturday. If you are within an easy driving distance, I'd really encourage you to come -- it's a great little show. There aren't a ton of vendors, but the vendors that are there are really great, and I like that it's a show with a lot of selection much not so much that it's overwhelming. I'll be sharing a booth with my friend Amy, and we'll have pattern samples for you to see and patterns to purchase (in addition to my mound of handspun). 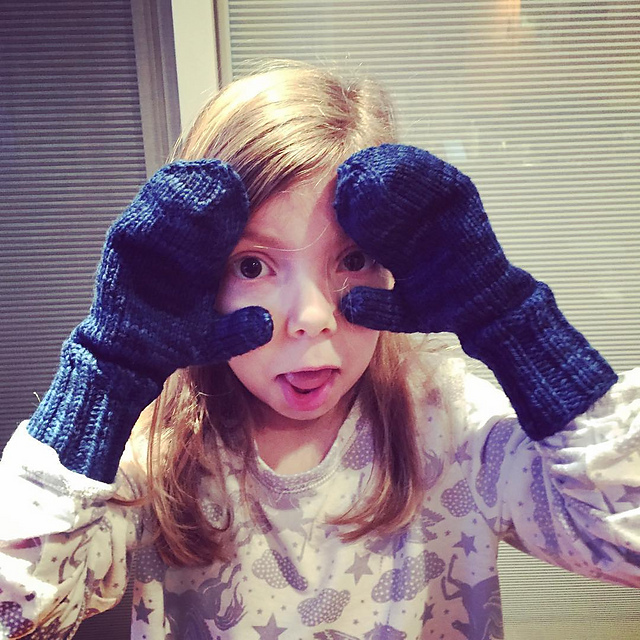 Mittens, mittens, we've got mittens! Two new pairs, to be specific. Let's go through the details. Mods: I altered the placement of the thumb gusset a bit, but it's not something you'd know by looking at the mittens (just a manifestation of my need for symmetry in all things). These were a quick, easy knit, and as you can see from the goofy picture, Miss Rainbow was very excited to get them. I took it as a big compliment that she wanted to wear them immediately, even though we were in the middle of a heat wave when I finished them and it was nearly 70 degrees! These mittens used up a partial skein of the Targhee Worsted I had leftover from a sweater I knit last year -- yarn, I should add, that the Mister and Rainbow had bought for me as a gift. There's still a small amount leftover, too -- proof that two skeins of this yarn can go a long way. These were finished just before it was my bedtime last night. I'd finished the first mitten over the weekend and started the second on Sunday evening, so clearly these are a quick knit. I followed the pattern exactly and made no mods, and the finished mittens are a pretty good fit. If I knit these again, I might make the thumbs a tad bit longer, but otherwise they are pretty comfortable. My only complaint (and this is entirely to do with me, not the pattern) is that the mittens are not symmetrical. I suppose I could have taken the time to rechart the pattern to make one mitten the mirror image of the other -- something to do next time, I suppose. I have zero complaints about the yarn -- it's absolutely one of my favorites. I have to weigh my leftovers to see how much I have and if it's enough for a small project like a baby hat. Up next? More mittens! I'm going to make another pair of Waiting for Winter Mittens in Spud & Chloe Sweater (the extra skein from Rainbow's sweater) to donate through my LYS. And I am really itching to cast on for a new design, but that requires some work first. We'll see how long I'm able to resist. That's more than 70 skeins of handspun, ranging from laceweight to super bulky and from less than 100 yards to close to 700. There's some undyed fiber and plenty of dyed fiber, with many different wool types represented. Meanwhile, seeing as I'm hoping to get a lot of the above yarn out of the house, it was only appropriate that I spent a good part of the weekend spinning up some yarn to replace it. I finished the second bobbin of my FatCatKnits club fiber (superwash merino/sparkle) Friday night, even staying up a little late to finish. I decided to try a new method of plying with my two bobbins. I chain plied all the singles but while holding both strands, effectively getting a four-ply yarn. To vary the colors, I alternated which bobbin I pulled the new loop from. The results were a bit unusual but not uninteresting. I finished rather late in the afternoon, so there was very little natural light to take a photo of the finished yarn, but I think you can get the idea. The yarn has been skeined and washed and is now hanging to dry. It looks to be about sportweight and fairly well balanced; I'm hoping to have somewhere in the neighborhood of 300 yards. I don't know that I'll do this type of plying again, but it was certainly a fun experiment! You may remember that earlier in the year I was super excited about having two patterns published in Knit Now. These patterns were only available by buying a copy of the magazine -- until now. 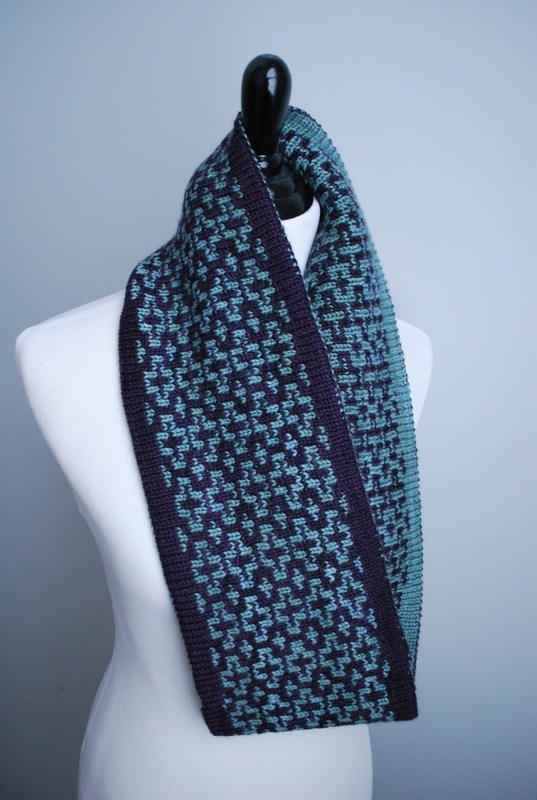 The rights have now reverted back to me, and as you've seen over the past few weeks, I've been busy knitting up new samples and having the patterns re-tech edited so that I could release the patterns in my Ravelry store. 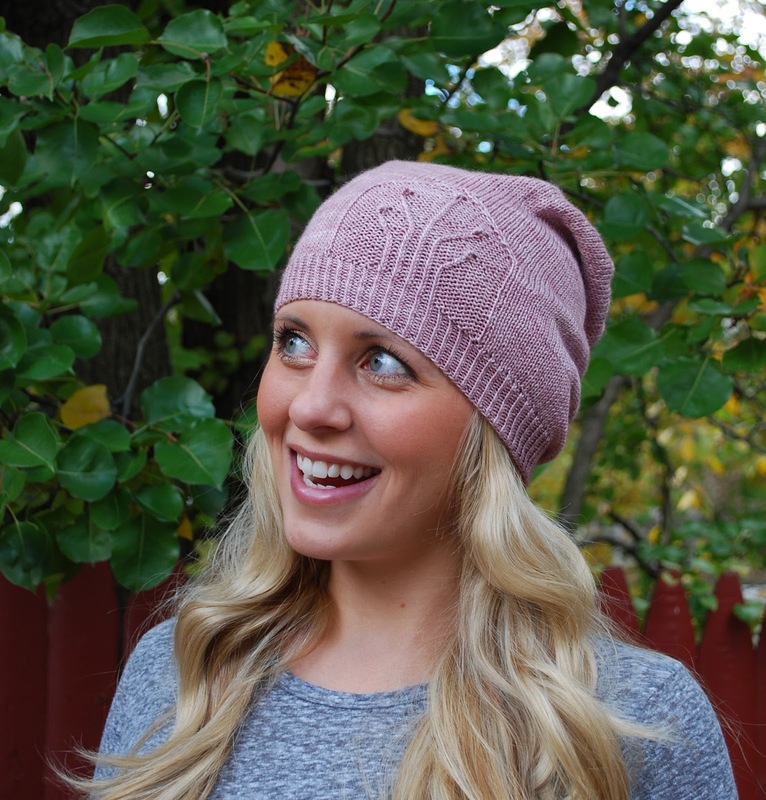 I'm very happy to tell you that you can now purchase the patterns for both the hat and the mitts! How cute is my new sister-in-law? She was so enthusiastic when I asked her if she'd be willing to model for me, and we had some fun doing this impromptu shoot in the backyard (in front of the only tree that still has leaves on it, for the record). Both the hat and the mitts are shown in the medium size -- that's a 20 inch hat circumference and an 8 inch hand circumference, in case you're wondering. Both patterns are available in three sizes. To get all the specs on these items, click on the links in the photo captions to go to the Ravelry pattern pages. I have been counting down the days until I could re-release these patterns, so please forgive my excitement! Even though I feel like I've been working on these two patterns forever (the original prototype of the hat was done about a year ago at this point! ), I'm still very much in love with them. I finished the first mitten for Rainbow last night. She very conveniently fell asleep with one arm extended on top of the covers, so I went into her room several times to hold the mitten up to her hand and measure it. (It's a good thing she's a deep sleeper.) I am knitting her the smallest size of Susan B. Anderson's Waiting for Winter Mittens, though I shortened the total hand length by a bit because there's nothing worse for a kid trying to play outside in cold weather than too much fabric in her mittens. Rainbow tried the finished mitten on this morning and proclaimed it a perfect fit, so we are a go for the same length on mitten #2. I did start the cuff last night but only got about an inch done, which is why it isn't in the picture. Considering how quickly the first mitten knit up, I wouldn't be surprised if Rainbow has a finished pair by the weekend. I made a little bit of progress on my own mittens (Kirsten Kapur's Wood Hollow Mittens) on Saturday while knitting at my LYS; I have finished the thumb gusset and put those stitches on scrap yarn, so now I am just cruising up the hand. While this project isn't moving along as quickly as Rainbow's mittens, I am enjoying it. I know some people have found it a bit confusing to work the cable pattern and the gusset increases at the same time (because the cable crosses occur every other row but the gusset increases occur every third row), but I've just been paying close attention to my knitting and haven't had a problem. I am also doing my cables without a cable needle -- my preferred method, if it works for the pattern -- so the knitting moves along at a good clip. I would hope that a good solid evening of knitting would be enough to finish the hand of this first mitten. When both of these pairs are done, I'm planning on casting on a third pair in the leftover Spud & Chloe Sweater. I'll be doing the Waiting for Winter mitts again, and I'm planning to donate these through my LYS. Rainbow also keeps asking for a pair of fingerless mitts, so I'm contemplating making her a pair as a Chanukah present, perhaps using handspun. After that, I think I will be quite mittened out for the year! Dealing with my stash is something that's constantly in progress. I have been buying yarn and fiber for many years now, so there's quite a bit of stuff in there, but I am trying to make a concerted effort to keep it under control. As far as the fiber stash is concerned, there has been a fair amount coming in due to the two fiber clubs I'm in. One way to try to keep that managed is to try to stay on top of the shipments -- which is why I put in several hours this weekend trying to finish spinning up the second bobbin of my most recent FatCatKnits shipment. This is the second colorway (Sam of Sam and Dean), and I'd estimate that I'm somewhere between one-half and two-thirds done with it. I started it Friday night and spent about another hour on it today, so I think another evening or two should do it. I'm hoping to find time this week to finish these singles so that I can ply next weekend. This is just some of the handspun I've pulled out to sell at the event. What you can't see are the skeins that I already labeled and set aside as well as what's still in my stash (some because I want to keep it and some because I haven't gone through it yet). It's hard to get a sense of scale, but that's a pretty big plastic bin they're crammed in there. By the time I called it quits for the day, I'd pretty much filled the bin (many of these skeins were in individual plastic bags, which took up even more space) and there were still more skeins left to label. Some are going to take a bit more time because in some cases I need to reskein or do some calculations to determine yardage, but most of the pile has been labeled and accounted for. And by golly there's a lot! Digging into this was a bit like going back in time, because there are some skeins from when I first started spinning in this pile. It's hard to believe they've been sitting there all this time. I just home someone else will love them and take them home!